.... It's worth noting that two of the most impressive figures in American history, James Madison and Abraham Lincoln, showed the ability to compromise at key moments. 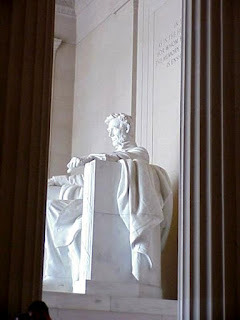 It was Lincoln, as a young man, who said, "The true rule, in determining to embrace, or reject any thing, is not whether it have any evil in it; but whether it has more of evil, than of good. There are few things wholly evil, or wholly good. Almost everything, especially of governmental policy, is an inseparable compound of the two; so that our best judgment of the preponderance between them is continually demanded." The Lincoln biographer William Lee Miller, building on this point, added, "[M]any reflective moralists, and most serious politicians, including Abraham Lincoln, perceive ... that good and evil come mixed and that the moral life most of the time (not quite all of the time) consists of making discriminate judgments, judgments at the margins, discernments of less and more..."
The word compromise is something of a Rorschach test. Those who hold a liberal worldview often consider conservatives who fight hard for their cause to be inflexible and unreasonable, just as those who hold a conservative worldview often consider liberals who fight hard for their cause to be inflexible and unreasonable. What determines whether we judge a politician to be a profile in courage or a profile in intransigence almost always depends on whether we're sympathetic to the cause they are championing.